ETCetera is putting on 2 plays loosely based on Grimm’s fairy tales in the last week of October 2017; theatre Le Foyer (upstairs at Centre Culturel d’Auderghem): please note these plays are not for children! Etre le loup: in French: Director Christine Marchand . Please let us know by mail if you are interested, and to which audition you can come; if you are interested but cannot come to either audition, please let us know and we will find another opportunity to meet. This entry was posted in 2017-2018, ETCetera on 19 April, 2016 by peterw. Life Reflected will be an evening of poetry readings, devised and staged by Malinda Coleman. The poems chosen will revolve around big life themes, and will include both old favourites and new discoveries. Malinda would ideally like six readers: three couples of three age-groups: young (20s-30s) adults, middle-aged, and the pre-old … Everyone auditioning is invited to bring along a favourite shortish poem, but this is not obligatory. Auditions will take place at the Warehouse on 20 & 22 June at 19.30; and 25 June at 14.00. Performances within the period November 5 -18 2017 (possibly not the full 5 performances per week). This entry was posted in 2017-2018, ECC Brussels on 20 June, 2016 by portal_admin. Hugh Dow is holding hour-long poetry and music evenings on the 15th and 16th September. 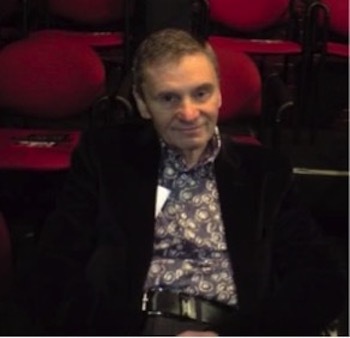 Some of Brussel’s finest actors will be reading poems which have sustained and delighted him over 65 years. The music will be judiciously added, as tonic to gin, for dilution. To justify the somewhat extravagant title there will be bubbly and small eats after. This entry was posted in 2017-2018, ECC Brussels on 15 September, 2016 by Conrad. 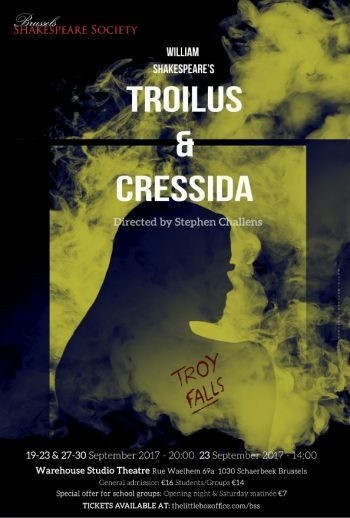 The Brussels Shakespeare Society presents William Shakespeare’s Troilus And Cressida directed by Stephen Challens. Performance dates 19-23, 27-30 September. This entry was posted in 2017-2018, Brussels Shakespeare Society on 19 September, 2016 by shaksoc. Chorus auditions are coming! They will be held from 11-12:30 pm on Sunday, 24 September at the Warehouse Studio Theatre (Rue Waelhem 69a, 1030 Brussels) in the bar room. Hope to see lots of you at the auditions! If you are unable to attend the auditions, but would like to be considered, please contact us at conradtoft@gmail.com. This entry was posted in 2017-2018, ECC Brussels on 24 September, 2016 by portal_admin.